Valhalla’s Drew Drayton-Bey rises for a shot in the lane during the Vikings’ win over Briarcliff. 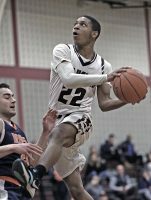 For the first 24 minutes last Thursday night, there wasn’t much separating the Briarcliff and Valhalla boys’ basketball teams. The two squads were tied at halftime, then scored 15 points apiece in the third quarter. But a fast-break layup by the Vikings’ Jordan Rush just over 20 seconds into the final period broke the sixth deadlock of the evening and gave Valhalla the lead for good. With Rush, Sebastian Pacheco and Drew Drayton-Bey all finishing with 10 points, the host Vikings earned a 51-43 victory over the Bears in a key Conference III, League A game played at Kensico School. Before the decisive fourth quarter, the lead changed hands nine times. Five of the lead changes came in the third period, which began with the Bears scoring five quick points and the Vikings answering right back with seven straight. An old-fashioned 3-point play by the Bears’ Taijon Tribble with a half second left tied the game for the sixth and final time and sent the teams to the final quarter even at 36 apiece. The layup by Rush, on a dish from Pacheco to start the fourth quarter, was followed by a top-of-the-key 3-pointer by sophomore Rahsean Melvin that gave Valhalla a sudden five-point edge. Two free throws by Tribble with just under six minutes remaining moved the Bears back within three, but then the Viking defense stepped up on four straight Briarcliff possessions by blocking a pair of shots, forcing star guard Miles Jones to miss badly on a jump shot and then drawing a charge against Jones a few moments later. Jones wound up with a game-high 19 points, but none of them came in the fourth quarter. Still, the Bears closed to within 42-40 on an up-and-under move by Tribble along the left baseline with 2:14 left on the clock. But Pacheco answered with a reverse layup with two minutes to go and Drayton-Bey added another layup 50 seconds later. A free throw by Rush with 35 seconds remaining stretched the Valhalla lead to 47-40 before Nick Reish gave the Bears a glimmer of hope by connecting on a 3-pointer with a hand in his face with 24 seconds left. A pair of foul shots by Rush with 22.9 seconds to go all but sealed the Viking win and Pacheco provided the final margin by hitting two more free throws with 7.8 seconds remaining. The Bears, trailing 7-6 after the low-scoring first quarter, quickly found themselves facing a six-point deficit when the second period began with Rush making a 3-pointer and Drayton-Bey scoring on a put-back. But then Jones erupted for seven points in one minute to trigger a 10-0 Bear burst. His 3-pointer from the right corner with 2:07 left in the half gave Briarcliff a 21-17 lead before the quarter ended with baskets by the Vikings’ Fran Falco and Pacheco that tied the game.